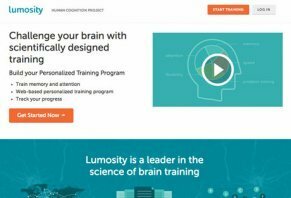 Lumosity Reviews - Is it a Scam or Legit? Developed by neuroscientists, Lumosity is an online tool intended to improve your brain performance in five cognitive areas: Attention, flexibility, problem solving, speed, and memory. Lumosity accomplishes this by using a series of online games and exercises to improve core cognitive functions, and claims that anyone can benefit, regardless of age or background. The site claims that researchers have measured tangible improvements in individual cognitive areas after working with the program. Based out of San Francisco, CA, Lumosity has been in business since 2006, claims to have more than 40 million registered users, and an A rating with the Better Business Bureau. Their in-house PhDs and R&D teams work closely with scientists and researchers from major universities such as Berkeley, Columbia, and more. In fact, their collaboration between neuroscientists, clinicians, teachers, and academics—known as the Human Cognition Project (HCP)—has acquired data from over 40 million subjects in order to help improve their cognitive training program. From this, they’ve taken advantage of the brain’s innate neuroplasticity, and used it to create a program that helps improve core cognitive processes in many different areas. Signing up for Lumosity is quick and free, and does not require that you enter any of your billing information. Just answer a few questions, and you’re off. You’ll be prompted to select certain aspects of each cognitive area that you’d like to improve, after which Lumosity will tailor the exercises to your specific needs, in addition to your age, level of education, desired goals, and so forth. For example: Under the Attention cognitive, you’ll be asked to indicate the sub-tasks that you’re interested in improving, including maintaining focus throughout the day, concentration while learning something new, avoiding distractions, etc. After signing up, three exercises will be available; the Speed Match, Memory Matrix, and Eagle Eye. In order to unlock all 33 games, you’ll need to purchase full access. Lumosity provides all members with recommended schedules as to how often you should perform your daily exercises in order to achieve maximum results. Each of your exercises are assigned points, and you’ll earn more each day by improving your scores and completing all the assigned exercises in your training session. In addition to scores, Lumosity keeps close track of your overall cognitive performance—known as Brain Performance Index (BPI)—and is calculated using the combined results of your best games. Based on your performance, you’ll then be able to see how well you stack up against other members. Lumosity constantly tests their results through random controlled trials, where a user’s baseline brain performance abilities are calculated, and then compared to later test results to determine overall effectiveness. In addition to using a desktop computer, Lumosity also offers iPhone and iPad apps at no additional cost to premium members, though they are not as full-featured as the desktop version. The company claims that support for Android and other non-Apple devices is currently under development. Regardless of the plan you choose, you’ll be automatically billed on the date your current membership expires, using the card Lumosity has on file. In addition, it’s important to remember that your renewal rate may not match your original rate, especially if you signed up under a promotional offer. While there are no refunds available on month-to-month memberships, Lumosity does provide a 30-day money back guarantee on all annual and lifetime plans. I signed up for Lumosity in 2012 and lost interest in a few months. I had no idea they were auto charging me $80 a year every year through PayPal until I just happened to see the most recent charge on my PayPal account. To date, I have paid them nearly $600 in auto charges unbeknownst to me. You can buy a lifetime membership for $270, lol. What a joke. When I called their customer service line there is no live person to talk to. I am going to try to open a dispute with PayPal as I'm sure the charlatans that run Lumosity aren't going to refund the money they scammed me for. I would give 0 stars if possible, don't give these con artists your payment info! I used Lumosity for two years and had an annual membership. I signed up because I believe in keeping my mind sharp, and there's a history of dementia in my family - I wanted to take action in my 30's. I had access to about 25 different games to play, that focused on different areas of the brain - memory, mathematics, forming words, etc. The games were fun and pretty enjoyable - a memory game where you work in a coffee shop and have to remember all your customers' first names was especially challenging and rewarding. However, I didn't notice that my mind functioned better after playing - I didn't remember more things, or remember more quickly. Lumosity gives you dashboards that tell you how you are doing against your peers (people in your age group). And while I initially found this inspiring, so I played every day to see how my scores matched up, over a few months I felt overwhelmed and depressed about "not taking care of my mind." In the end, I decided the games were not fun enough or effective enough to keep paying this money every year, so when my second year of subscription ended, I canceled. It's possible Lumosity will make the games more compelling or the community will become friendlier and softer. I used the product for some time and felt no improvement. Then I canceled, but they keep charging me and refuse to reimburse the charge due to policy (although they can see I haven't used the product for years). SCAM. Lumosity is interesting, different, and makes my mind work. I've been a Lumosity subscriber for over a year now. I joined up because I wanted to do something proactive and tangible to keep my brain active. I was in my mid-40's and looking for something to keep my brain engaged. I was intrigued by Lumosity's premise and decided to try it. I find the games interesting and engaging. Lumosity has been investing in making new games and improving existing ones. So the site and games are fresh and frequently changing. I do wish there was a bit more control available to pick and choose what games to play, but I am trusting their 'algorithm' to choose correctly for me. I must confess that now, after over a year, I find it difficult to make the effort to login daily. But that is due to me getting distracted by other things rather than any knock on Lumosity. An amazing game that drives me crazy in a good way. Lumosity is a brilliant website based training tool for improving various aspects of cognition. I have been using it for two weeks now and have already seen improvements to my memory, and attention. It was recommended to me by and friend, and I would recommend it to you, especially if you are looking to increase your focus, memory, or mental speed. The games aren't tedious, it is graphically beautiful, so keeps your interest and a whole lot of fun. "Train of Thought" will drive you crazy though. I also recommend this for kids. If they want to play on the iPad like mine always do then let them - but only to play Lumosity. Write a Review for Lumosity!